Some days I just don't seem to have this whole motherhood thing under control.. yesterday was one of those days! So today I will be keeping my eyes open with copious amounts of Tea! Luckily, a beautiful new teacup arrived on my doorstep yesterday.. It was my second Etsy purchase. 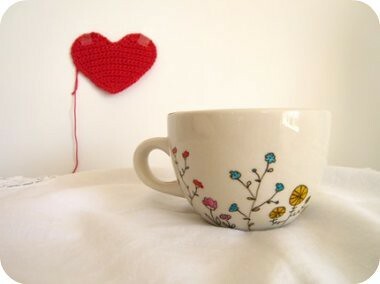 The teacup is from a little Etsy seller called thimbly things. She also has a blog that I really love. Speaking of Etsy, I came across a hilarious website yesterday called 'Regretsy'. I was told that this website would make me laugh out loud.. and it actually did! Its a little cruel to be laughing at other peoples home made items, but some of the items are just unbelievable.. 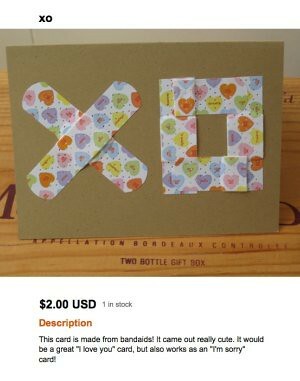 This card is made from band-aids.. "It would be a great I love you card. but also a great I'm sorry card!" That was just what I needed to cheer up my day!